Airline flights are canceled all the time. Airline schedules are changed all the time. The Internet can make it easy to find the latest information about airline departures and arrivals. But what if you’re not near your computer to get the latest airline flight tracking status? Are you leaving town on a flight, but want to make sure that it’s on time before you head for the airport? Are you picking someone up from the airport and want to make sure their flight will be arriving on time? Have you already arrived at the airport to pick someone up, but you don’t know the status of their incoming flight? You’re sitting on an airplane, the plane has just landed, and you want to know the gate number and departing time status of your connecting flight? You want a weather forecast for either the departing airport or your destination airport? You want to know how long it takes to get through security before you go to the airport? 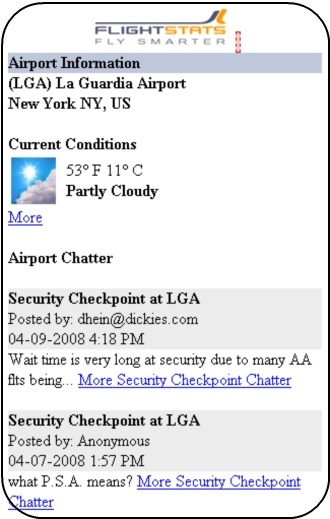 Some excellent websites allow you to quickly and easily get all these answers about airports and airline flight status from your Blackberry, Treo or any other smart phone. Recently, I was on a flight to Atlanta, Georgia, one of the busiest airports in the world. Our flight to Atlanta was delayed, and although on Atlanta was my final destination, many of the passengers around me had been keeping their fingers crossed that we would land in time for them to catch their connecting flights. The woman sitting next to me was especially nervous; the airline that we were flying allowed only 30 minutes from the time we landed until the time she was required to get her connecting flight. As our wheels touched down, I removed my smart phone for my pocket and quickly activated my phone’s Web browser. I tapped the bookmark on my phone browser to go to FlightStats.com, and 2ithin 30 seconds I was able to tell my seatmate that her outgoing flight was 30 minutes delayed and that her connecting gate was C32. Furthermore, I told her I hope she packed an umbrella, because it was raining at her final destination. When several other people in the seats around us heard what I told the woman, they began to shout out the numbers of their connecting flights. By the time our plane had taxied to the gate, I had told nearly a dozen people the status of their outgoing flights and the gates for their connecting flights. The first screen asks for a partial name of the airport or the airport code. The current date and time appears as the default, but you can used to drop downs to choose dates and times in the future. You can also type a partial airline name or airline code. 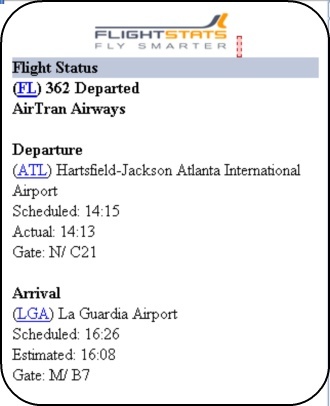 In the image above, I use the airline code “FL” which is an abbreviation for AirTran Airlines. After selecting an airport and airline, your phone will display arriving and departing flights for that airline at that airport. You’ll also see both scheduled times and actual times. This is especially helpful if you’re taxing to the gate and need to know the status and gate of your connecting flight. It’s also helpful if you are picking someone up from airport and want to know if their flight will be late. If you click your Airport code on any of the flight status screens, you’ll see a weather report for that airport and you’ll see chatter written by people at that airport that may discuss airport security delays or any other information that could be important to travelers at that airport. FlightStats.com is absolutely free. 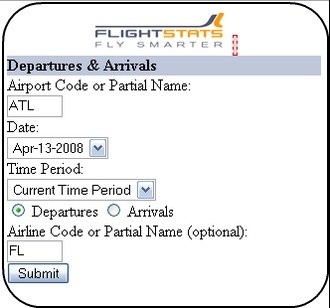 Visit FlightStats.com from your home computer, your laptop or your Internet enabled smart phone for fast, free information about airline flight status, airline delays, and airport weather.